Does anyone else see the orange ball monster hiding behind the VAB throwing an asteroid onto that poor unsuspecting kerbal? I see it every time I load the game. No, no...it's obviously in the foreground. It's the ghost of the previous kerbal ground handler, and the two brighter dots are his batons. There's not actually a spaceship on the runway, they're just attempting an exorcism. This is customary on Kerbin. Look at that guys face. He knows what's coming, he accepts his fate..No! He embraces it. I hate to be the voice of reason, because I am really enjoying the humorous answers in this thread, but isn't it just suppose to be lens flare? The Kraken's Bane. A creature that evolved to hunt Krakens. What I see is a completely baffled orange monster whose jaw dropped on the floor. Generally to see lens flare, you also need to see the light source in order for that to flare inside the lens. 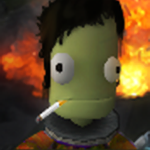 But you added the monster throwing asteroid (Mun) on the poor kerbal part. This was a good laugh lol. 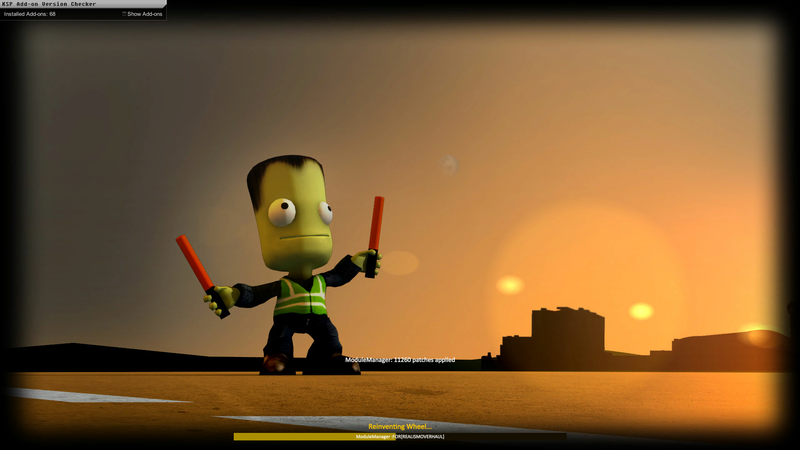 He (poor Kerbal) is using the glow sticks as a traffic warden to instruct the Monster where to aim the Moon. Either that or he's conducting a Armageddon inspired sad song in front of a crowd that are awaiting the upcoming doom. That probably didn't/doesn't happen as it is not in the freaking pic, just my theory though. First time I saw it I thought Mothra (in the caterpillar stage). You youngsters can google it. Yup. From the very beginning I saw that picture I saw the monster, like a huge Space Baby crawling over the horizon, but not the meteor being thrown. What space baby?! Those are obviously the twin suns of Tattooine, and the Kerbal is a Sith dual-wielding red lightsabers. Is that the Kraken? What if the Kraken is not a Squid/Octopus, just a ghost blob god.